Most parents take their children to the library or museum to learn more about history. Julia Morgan-Scott’s mother, however, took her to old cemeteries. Hallowcon’s medieval-horror theme, Ms. Scott said, makes it a perfect venue for her. “We’ll be on a panel, talking about where we get our horror ideas,” she said. Ms. Scott’s illustrations have not only appeared on magazine covers, but also in scientific journals and textbooks. Ms. Scott decided to pursue a career as an artist while on a trip to Europe at age 18. There, she was especially impressed by the Italian Renaissance paintings she saw in Florence at the Uffizzi art gallery. Yet, life took its toll on Ms. Scott and pursuits as an artist. She went to college, fell in-love, got married, left school, had a child, then got a divorce. As a divorced single mom, she felt like “an overweight house wife” who needed to create a new identity for herself, she said. 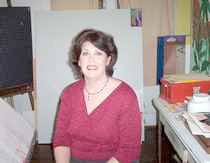 She went back to school and earned an art degree in 1984 from U.T. Chattanooga. Getting back to art, she said, gave her self-esteem she needed. Her illustrations were first published in Cerebus, an independent comic. Since then, her art has been published in Aberrations, Flesh & Blood, and Deathrealm magazines. Ms. Scott has illustrated game art for Warlords and 7th Seas, but found the game industry difficult to enter. Oddly, gaming companies rejected her drawings, she said, because they weren’t dark enough for their markets. “I wasn’t able to do the kind of art they wanted … too romantic” she said. Ms. Scott is an illustrator for UTC’s Biology Department. She illustrates fossils and bones under a grant-based program, she said. She has two adult children and three grandchildren. Two of her grandchildren attend Sci-Fi conventions with her and husband, Ken Scott. Her son, Alex, wants to be a Sci-Fi writer. The 21-year-old is a creative writing major at UTC. She said he’s studying science and anthropology to enhance his genre writing. Ms. Scott is wasting no time trying to widen her horizons. She’s delving into more fantasy and surreal paintings than horror and Sci-Fi. She’s also doing more writing than before.